In her fifth collection, Panicle, Gillian Sze makes her readers look and, more importantly, look again. It's a collection that challenges our notion of seeing as a passive or automatic activity with poems that ask us to question the process of looking. The book's first section, "Underway," deals with the moving image and includes both poetic responses to film theory and lyrical long poems while also reimagining fairy tales. The next section, "Stagings," takes its inspiration from the still image and explores a wide range of periods, movements, and media. Sze's focus on the process of looking anticipates "Guillemets," a creative translation of Roland Giguère's 1966 chapbook, Pouvoir du Noir, which contains a series of poems accompanied by his own paintings. Sze's approach to Giguère is two-fold: she "translates" his text and artist Jessica Hiemstra provides a visual response to her translation. The final section, "Panicle," continues the meditative quality of "Guillemets" in a suite of poems that ruminate on nature, desire and history. Available online and hopefully at your local bookstore. Sze's intense gaze is curatorial: elements are arranged much as they might be in an exhibition ... Reminiscent of both Grecian sculpture [and] calligraphic brushstrokes, these attuned, finely wrought poems interpolate the other in surprising ways, and, through the rich invocation of other personages and texts, culminate in a celebration of difference, as sparse as it is sublime. Beneath its enticing delicacy, Sze's most potent work simmers with eroticism and, often, danger. Through such means as fairy tales, ekphrasis, and urban voyeurism, she evokes situations and settings all the more immersive for their potential risk. With their (and our) senses on high alert - the standard five, plus intuition - these poems chart modulations too subtle for most instruments. From the sounds of "an inkstick grinding against stone" to that "small gasp / a small ah" of the closing poem, "Panicle," Gillian Sze takes you on a journey, like Du Mu's traveller, to break the heart with its lyric grace and staggering beauty. In Panicle, Sze writes, 'people grew alphabets / and found a way / to make voice / into marks / just so we could see / sounds.' But it is she who makes theses black slashes sing with query, surprise, and longing. In letting us bear witness to her looking, she allows us to see. Sze wakes us and we are both warmed and disquieted by a singular and remarkable voice. 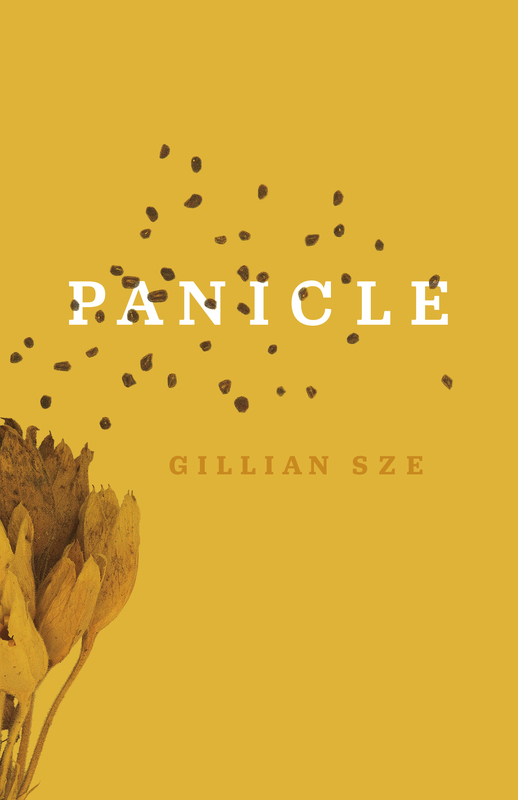 Panicle by Gillian Sze is collection of poems that are like jewel boxes: precise, specific and perfectly contained. People are changed by landscape and the small still-lifes that appear and then disappear. It is this poetic space that Panicle inhabits, with a voice that observes, charts and translates with just the right words. The writing of Gillian Sze does something special; reading her work feels as though the walls around you turn to clouds and you're floated into a dreamscape. Her latest book Panicle is no exception. Sze manages to slice into a moment to see all the working parts, letting each of those moments branch into another, creating a complex surreal landscape. Poems that grow to the size of the world and shrink down to a pin prick. One of my favourite poets writing today, who always delivers.